Elephant Hills is a luxury tented-camp with a main jungle camp on the edge of Khao Sok National Park and an overwater camp at stunning Cheow Larn Lake. 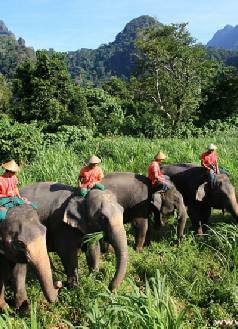 Combining the camp idea of African national parks with the Thai tropical rainforest, Elephant Hills is a unique and highly recommended experience. Transfers are included from Phuket, and also available from Khao Lak, Krabi or Koh Samui, so why not enjoy a few adventure-filled days before you relax at the beach? Tents at both camps provide ample space and have their own en suite shower and toilet. Furniture is handmade by skilled craftsmen using natural materials and provides all the comfort normally found in hotel rooms. Buffet meals are included at both the Jungle Camp and Rainforest Camp during which there’s time to meet other guests and discuss the day’s adventures - at the Jungle Camp there’s even a roaring campfire! There’s a well-stocked bar with an array of wines, spirits, beers and soft drinks to relax with. Evening activities at the Jungle Camp include cookery demonstrations and dance performances by local schools. A variety of soft adventure tours are available, either staying at one camp or combining the two. During your stay several activities are included from simple forest walks to lengthy treks, scenic canoe trips, sailing through the mangroves on a traditional Burmese junk and an unforgettable encounter with elephants which is sure to be the highlight of your stay. All activities are in small groups and are accompanied by knowledgeable guides. Spend three days in and around Khao Sok National Park experiencing this wonderful setting before heading to the beach at nearby Khao Lak, the easiest beach area to visit after your elephant experience. Thailand’s first luxury tented camp sits on the edge of Khao Sok National Park within the largest area of rainforest in southern Thailand. The scenery is dramatic, with soaring peaks, meandering rivers and jungle-clad forests filled with flora and fauna some of which is unique to this area. The symphony of the birds and animals calling each morning is an ideal alarm clock to rouse you for the day’s activities which may include a canoe safari, jungle trek or memorable elephant experience. Return to camp and enjoy a refreshing dip in the pool, a cooling drink from the bar and perhaps even a quick nap in the hammock outside your tent before dinner and the evening activities. Accommodation: In one of 30 luxury tents with fan, shower, safe and deck. There are no televisions or telephones in the tents. After a night in Phuket head to the mainland for a two night adventure at Khao Sok National Park, experiencing the wonderful Elephant Hills. Return to Phuket for a well-earned week of relaxation. Combine beautiful Khao Sok National Park and the Elephant Hills experience with the stunning coastline of Krabi, for a truly superb Thai holiday experience. A range of beach hotels and various durations is available. Spend a few days exploring Bangkok before heading to Khao Sok National Park for a two night adventure, experiencing the wonderful Elephant Hills. Finish your holiday ton the beautiful beaches of Phuket. Start your Thailand adventure with a few days in the Thai capital Bangkok, then continue to Khao Sok National Park and the Elephant Hills experience, finishing on the stunning coastline of Krabi, for a truly superb Thai holiday experience. Explore Bangkok for a few days before spending three days in and around Khao Sok National Park, experiencing this wonderful setting. Finish on the beach at nearby Khao Lak, the easiest beach area to visit after your elephant experience.